Width and thickness of the boards. Load placed on the floor. Different types of wood vary in stiffness and resistance to bending, with some species being much stronger than others. Even within the same species there is considerable variation in strength depending on the growing conditions of the tree. The lumber from slow growing trees, which have more end grain growth rings per inch, is much stronger and denser than faster growing trees of the same species. High Bending Strength: Southern yellow pine and Douglas fir. Medium Bending Strength: Hemlock, spruce, and redwood. Low Bending Strength: Western red cedar, Eastern white pine, and ponderosa pine. 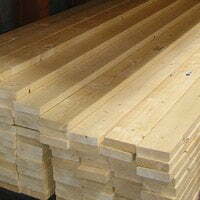 The grade of lumber used for joists is also a factor in determining the strength of the wood. Since knots and other defects weaken wood, higher grades of lumber (designated as clear, select, or #1) are considered stronger than lower grades. Higher grades of lumber, however, are also much more expensive. Lumber graded as #2 is the most common choice for floor joists and other framing lumber. It has more knots and defects than higher grades, but usually not enough to cause significant loss of bending strength. Lower grades of lumber (designated as #3, utility, and #4) often have too many large knots or other defects to be used for floor joists. Regardless of the grade of lumber used, try to choose boards which have few knots or defects and that are straight, with little crook along the length of the edge. When possible, position floor joists with any crook in the board facing up, so the weight on the joist will tend to straighten it out. Any large knots found near the edge of the board should face up as well, so the weak wood of the knot will be compressed rather than stressed. The width of a board is an important factor in determining the distance a floor joist can span, playing a much larger role than the thickness. For example, if you double the thickness or number of joists in a floor, the distance the boards can span will increase by approximately 25%. But if you double the width of the boards, the distance the joists can span increases between 80% to 100%, even though you’re using the same board feet of lumber. The amount of weight on the floor is also an important factor in determining joist size and span length. The weight of the building materials (joists, subfloor, flooring, and ceiling) is known as the dead load and is commonly rated at 10 pounds per square foot. You can calculate the dead weight yourself by adding up the weight of the building materials, then dividing by the number of square feet the materials will cover. The weight that will be placed on the floor is the live load and includes furnishing, people, and anything else you plan to store on the floor. 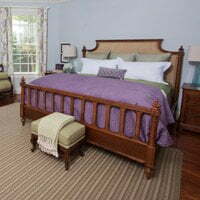 Live loads range from 30 pounds per square foot and up, with 40 pounds the norm for most residential rooms and decks. Obviously if you’re a piano collector or plan to crowd as many people as possible onto your deck, you should err on the side of caution and increase the size of the floor joists or reduce the span. Putting all these factors together gives the minimum size joists needed for various types of wood, grades of lumber, sizes of boards, spacing of joists, and the load that will be placed on the floor. You should also check your local building codes before starting construction and consult a structural engineer in unusual or extreme situations. Below is a table giving the minimum size floor joists needed for 16″ and 24″ on center (o.c.) spacing when using #2 lumber with 10 pounds per square foot of dead load and 40 pounds of live load. You can always use bigger lumber, closer spacing, or a smaller span; just don’t go smaller, further apart, or a longer span. In other words err on the side of caution rather than pushing the envelope. I have a 20 X 40 X 18 ft RV building (basically 800sq ft) which I want to add a second floor. The walls are std concrete block. I want this added floor space (2nd floor) to support 23000 lbs of house hold furniture ( no water fixtures: tubs/sinks/showers or appliances ). As well as human traffic. To be storage space for 2800 cb/ft of house hold goods. The initial ground floor space of building is a work shop area for auto and wood crafts. What wood type and dimensions would be recommended to make this addition ? Build a house 2nd floor inside a block house which has a fl 1992 code truss roof and no windows . Certainly a lot of post . Or would steel be better placed as center and side columns ? I’m building a deck around my barn and thinking about using 2×6 fir floor joist 24″ or 16″ on center 8′ length for the 2×6 fir and 10′ span between 4×4 post out on the end and using cedar deck 2×6? @ John. If you wanted to reduce the (width) or vertical cross section of the joists you should measure the (width) of joist you need to make the floors even and adjust the span to accommodate that joist size. II’m wondering if there’s a way to reduce the width of the floor Joyce without giving up the Load strength and integrity. The reason I ask is because the addition that was put on has a floor height that was not correct it ended up that the floor height in the addition was two inches higher than the rest of the floor giving me a ramp between the new and existing. I’d like to eliminate the ramp. We had a 16×14 deck built with 2×8 12″ on centre and the deflection on the deck concerned me. I pulled it down and went to 2×12 12″ on centre and it has NO deflection even with the BBQ, tables (2) and 8 guests and gazebo. Overbuild… don’t underbuild and you will be happier with the end result… the difference in price between the 2×8 and 2×12 at the time of the build was $2 each. My basement wall is build with concrete blocks seem to be find however I don’t like the look of the block. 1, inside of the wall 2″ to 3″ thick in order look the same from inside with new added addition ? 2, I also like to raise the basement wall on existing in order to get the same height as with new wall? I want to build a 20×40 loft. Will 20′ 2×12 on 16″ centers be sufficient? How do I calculate the bearing capacity of a wooden deck built from 2×6″ fir stringers 16″ o.c. covered with 1×6″ fir planks? Will this support a total weight of 1 ton/25 square feet of deck (5×5 hot tub, plus 90 gal water, plus 2 people @175lbs)? Can I span 22 ft with 12 ft wide 1-joist?help! what about full dimension lumber? My daughter has a 100+ year old house she is wanting to convert the attic to living space and says she has old growth redwood floor joists under the area with a floor currently used only for storage, that are a full 2″ x 4″. They span the second floor rooms that are at least 12′ wide in places, can they be legal for a 30lb load? I am replacing subfloor in a bathroom due to some water damage. I used a toe kick saw to remove the damaged subfloor. I know I need to add blocking around the edge to secure the new subfloor to. Does that blocking need to be the same dimensions as the floor joists (2×10) or can I get by using a 2×6? Putting in box headers to reinforce a host the needs to be notched. Which would be a better option – doubling up 2×4s or a single 4×4? Unfortunately I don’t have much more clearance on one of the sides for more than 4 inches. I’m constructing a second floor living room space, currently the living room is a two story foyer that i want to close in and make living space above. i need to keep it in the 2×8 range because then it will match existing ceiling height and floor. i am thinking of putting in two LVL headers at a depth equal to a 2×8 and then ill run my 2×8 perpendicular to the header and teco them in i need the headers to be flush. do you think this is sufficient enough? On floor trusses with 40-20-5 loading, the 40 is live load, the 20 is dead load, what is the 5? I’m building a loft above my garage for storage. loft will be 19’7-1/4″ wide by 8’deep. can i get floor joists that will span almost 20′ without using column support? if so, what spacing between floor joists do you recommend? what size floor joists should i use (2″x8″)? my house is 100 years old. The joists are real 2 x 12 spaced at around 20 inches centered. The span is 16 feet from the centre beam. The problem is the noise when walking on the floor. Im thinking blocking will reduce the movement. What is the best way to reduce the noise/deflection. There are heating ducts and a couple of plumbing lines so 2 x 12 blocking cannot be continuious. What is the best solutions. Hi, I’m building a 16’x16′ room off the kitchen. How far apart do I need to have the floor joists, and what size joists do I need for the floor? Im building an island in the kitchen, 5 ft by 6 ft in the middle of the floor, the span is 14 ft, 2 by 10s (southern yellow pine #2), 16 in on center. The granite top weighs 540 lbs, is that enough support? Or do I need to double up my floor joists? A hypothetically question, in order to build a two story house with two balconies that are approximately 246 sq. ft., does that reflect with the size of joist that should be utilize and the spacing between the rafters o.c.? Also, if an A/C unit was to be installed, how much space between the first floor and second floor does it need? Furthermore, the entire sq ft of the house is approximately 2,520 sq. ft., including both floors. I’m enclosing a small shop in my airplane hangar. The dimensions are 16×20. The ceiling will not have much load on it at all. I was planning on using 16′ 2×8 ceiling joists @ 16″ oc with plywood decking. The only thing up there will be a small air handler for the AC and dust collector. Your thoughts please? hello, i am looking at building a second story room over my large dinning area, it is over 15 ft long and over 23 ft wide , if i run a support beam 23 ft can i do this without putting a pole in the middle of that room? or is there joist strong enough to run 16 ft to cover the 15 ft span? I have a 32’X40′ pole barn that I built to store vintage cars. I plan on placing the floor on 6″X6″ pillars spaced 8′ apart so I will be building 20 8’X8′ sections. Each 8’X8′ section will need to support 1/2 a vehicle. What spacing and what size boards will I need? I want to build a underground house. the span will be 25 feet, with 3 feet of dirt on top. What kind of joist should i use. I wish to put a floor in an outhouse for storage. The size will be 6 m long and 8 feet wide. It has been suggested I use timber 4×9 and 6 m long. Can you advise as to whether this would be the right size, whether spruce or pine would be ok. The floor is to store various household items. We need to be able to walk on it to get access to the items stored. I’m building a small cabin. 12 ft wide and 16 ft long what is your recommendation for floor joists. Also will have a second floor. Honduran pine is a hard pine, so it should have a high bending strength comparable to Southern yellow pine, but it doesn’t hurt up make your joist wider than the table suggests (other than the additional cost of the wood). I don’t know what the span of your joists will be, but for 10′ between posts you would need at least 3 2″x12″ together on edge (or a 6″x12″ beam on edge) for the sill beams to support a 20′ joist span. I’m going to build a house in Honduras on concrete posts, 8×8 and spaced at 10’x10′.I’ll be using honduran pine. I’m still trying to figure out the spacing for the floor joists and what size to use. I’d appreciate it very much if you could help me out. I want to build a 10’x12′ deck I have most of it calculated but could you help me decide on floor joist and the outside framing. Can I use 2″x6″ all the way or do I need heavier 2″x8″? This deck will hold a grill and table and up to 8 people at most at one time. I am very cost conscious but I want a long lasting safe deck.